My great uncle, on my Dad’s side, was a man called Joe Sime. He was a jockey in the 50s and 60s, but I hadn’t realised just how good he actualy was. There is some footage here of him winning a race, and I have quoted below some more information I was able to find. Traditionally run over one mile and six furlongs at Doncaster’s May Bank Holiday meeting, the Joe Sime Memorial Handicap is staged this season on 1 May at Windsor, while Town Moor is undergoing major refurbishment. Last year the race was won by Mark Johnston’s Hiddensee, ridden by Kevin Darley. In his day, Joe Sime was one of the leading Flat jockeys in the north. Born in Liverpool in 1923, he was apprenticed to Dawson Waugh and rode his first winner on Firle at Newmarket in 1941. He was champion apprentice in 1943, ’44 and ’46, when his 40 winners included the Portland Handicap on The Shah. Sime was always able to ride at around 7st 8lb and was noted as an excellent judge of pace. He became something of a big handicap specialist, teaming up on many occasions with Sam Hall, Yorkshire’s shrewdest trainer of good handicappers. For Hall, he won the 1950 Manchester November Handicap on Coltbridge, the 1957 Ebor Handicap and the following year’s Cesarewitch Handicap on Morecambe, and the 1960 Wokingham Stakes aboard Silver King. 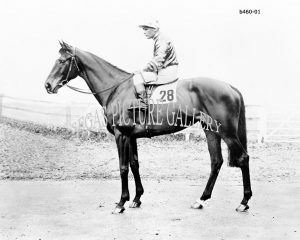 He also landed the Ebor on Procne (1947), Donino (1948) and Partholon (1963), the Wokingham on Light Harvest (1956) and the Cesarewitch on both Utrillo (1963) and Mintmaster (1965). He won three Lincolns and a Royal Hunt Cup, but his career highlight came with success in the 1964 Great Metropolitan Handicap, aboard Her Majesty The Queen’s Gold Aura. One of the few jockeys to smoke a pipe, the highly popular Sime enjoyed his best season when registering a total of 108 winners. He retired at the end of the 1968 campaign and the first running of the race that honours him took place in May 1999.